Does learning hands-on with Christopher Avery, “The Responsibility Process guy”, interest you? If so, let us know by registering here. It will help us make decisions about offering workshops. See the list of cities where registration is now open. Use the form below to let us know of your interest in a particular city where we are planning upcoming workshops. We will let you know as soon as registration is open. Interested in another city? Let us know. This book changed how I talk about responsibility in my training courses and with my teenage daughters. What is the workshop opportunity? 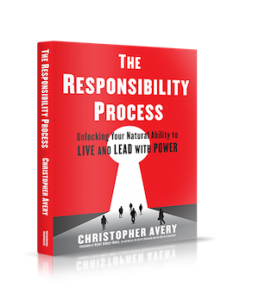 With the publication of The Responsibility Process book in October 2016, leaders, coaches, and trainers are finding exceptional value in The Responsibility Process Leading and Coaching workshop. It is one day, highly interactive, inspiring, and practical. Many say the workshop is life-changing. It earns ratings of 9.4/10. Increasingly coaches and leaders find The Responsibility Process foundational to agility. For coaches and trainers interested in teaching The Responsibility Process workshops, there will be a second day to prepare to be certified. The workshop and train-the-trainer will be on successive days. Note, signing up to be notified is not a commitment to register and attend. So get on the list now.